Customer always gets immediately required information. Delivery term must be shortest possible using ideal combination of technology. Trained and fully involved team keeps improving each process and prevent mistakes. We have succesfully completed PSO and PSD certification in accordance with ISO ISO 12647, based on Fogra standard. ProcessStandard Offset (ISO 12647 ff) is a guide to creating optimal, stable and reliable print products. It describes an industrially-oriented and standardized approach to manufacturing print products. 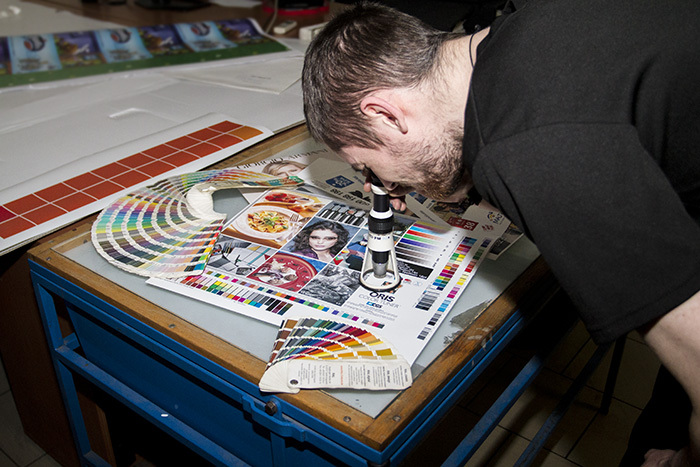 The complex production process is streamlined to be as efficient as possible and simultaneously guarantees predictable color quality of intermediate and final results. From data collection to final print product, PSO and PSD enables a qualitatively secured production. ProcessStandard provides offset and digital with sensible and feasible nominal values and tolerances for print production. In no way does it restrict the maximum quality achievable! Precise fulfillment of clients expectations is main target of the whole team.